not in this format. Please forgive me. I had forgotten how awkward this site is. So I will continue my daily yoga of a Florentine museum a day, but will only share it with you in an eventual book. Which, in its bulk, will be tedious for you to read. Sorry. Richard Serra and I agree, I think, that sculpture is not a joke (not Hirst, not Koons, not even Duchamp, except as a limiting case). It is deadly serious, an attempt to reduce, not elaborate, toward an essential gesture. It is the manipulation of a single material—a monolith (single stone)—to define space. Personally, I would be delighted to have Streep play me in the biopic, although they’re saying Swank has more physicality, and given the budget, they’ll probably go with Posey. Either Parker or Buster. Thanks for mentioning Irons, but he’s a bit long in the tooth. I have now completed my four-part metamemoir: An Old Junker, a blognovel (2006-2010) Dear Howard, a graphic novel (1982-1986) By, the complete journalism (1965-1969) I, a typographic novel. 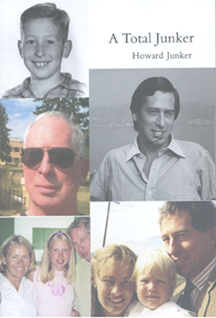 The search for a publisher may be endless, so if you’d like to see an advance copy, just ask: junker.howard at gmail. An Old Junker is now available on Kindle and Nook for $2.99. The fact that you can buy it on paper for $1.25 is no excuse. To see me reading at the Variety Preview room, click here. Click here for [Joyce Thompson's] HTMLGIANT review of AOJ. Last summer, AOJ came in at 16th at Small Press Distribution. 1 August, Monday, at the Conservatory of Flowers, Golden Gate Park, Quiet Lightning‘s Evan Karp previews the lineup: I read my North Dakota mountain-climbing story, my first fiction in print (photo: Julie Michelle): 29 July, Friday, 7 p.m.: Solo reading at Press: Works on Paper, 3492 22nd St. (Dolores) Click here for a glimpse. At a party at the publisher’s home in the Presidio yesterday, the author listens pensively as the publisher makes some introductory remarks. Readers follow along as the author reads out loud. After signing a few copies, the author pauses, sighs in relief.